Investment Highlights: 1. Opportunity for global real estate diversification in markets under proven recovery after drastic rent and value decrease. 2. An investment portfolio providing strong, stable operating fundamentals with an established and diverse tenant profile. 3. Low leverage capital structure coupled with an attractive and sustainable yield of approximately 7.81%. 4. 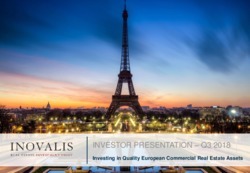 Platform for growth with Inovalis S.A. through cross-border French and Germany partnerships with direct access to a proprietary pipeline. 5. Experienced management team fully aligned with Unitholders.